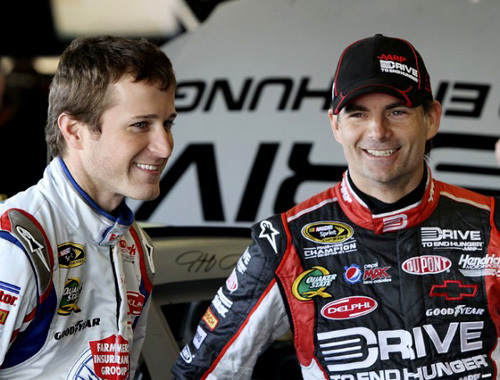 LAKEVILLE, Conn. (Sept. 15) – Jeff Gordon, along with teammate Kasey Kahne, Rick Hendrick and Alan Gustafson, are at Lime Rock Park from 3:00 to 5:30, Thursday, Sept. 18, for the track’s efforts to raise funds and awareness for AARP Foundation’s “Drive to End Hunger” campaign. NASCAR star Gordon has spearheaded Drive to End Hunger since 2011. Gordon, Kahne and Gustafson (Gordon’s crew chief on the #24 Drive to End Hunger Hendrick Motorsports Chevy SS in NASCAR’s Sprint Cup series) are giving “hot laps” around Lime Rock’s storied 1.5-mile, 7-turn circuit to those who donated to Drive to End Hunger, following a 45-minute hosted interview for hundreds of fans, each of whom donated $24 to be here. They’ll be driving prototype 2015 Chevrolet Camaro Z/28s. Local racing star Liam Dwyer (Southbury, Conn.), the armed forces amputee who made national news in May following his IMSA race win at Lime Rock on Memorial Day weekend – and someone Gordon has wanted to meet – will also be here; he’ll be giving Gordon some “recon” laps prior to the hot laps as Jeff has not raced at Lime Rock before. Lime Rock Park has set a goal of raising $96,000 in 2014 for Drive to End Hunger, the track’s Official Charity, and Thursday is the biggest element so far of the effort which provides food to needful seniors via the Connecticut Food Bank.